I've got a soft spot for feel-good, post-war Showa dramas that take place during the 1950s and early 1960s. Pure Horatio Alger stuff, an entire nation pulling itself up by the bootstraps. 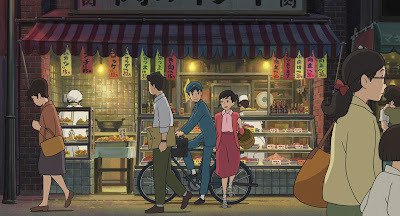 From up on Poppy Hill plays the heart strings with all the right chords. Unlike most Ghibli films, From up on Poppy Hill has no surrealistic or fantasy elements. As a girl-meets-boy high school melodrama, it could be favorable compared with Whisper of the Heart, that takes place a generation later. The story begins with Umi managing her grandmother's boarding house on a hill overlooking the Port of Yokohama. Her mother is doing post-doc work in the U.S. Her father was killed during the Korean War when his ship hit a mine, so she also watches after her brother and sister. Upon meeting Shun, however, our super-competent protagonist is thrown for a bit of a loop. Shun literally falls out of the sky while staging a publicity stunt in an effort to save the ramshackle old building that houses the high school's clubs from the wrecking ball. The delightful Ye Olde Curiosity Shop depictions of the clubhouse alone are worth watching the movie for. Shun publishes the school paper, and had already caught Umi's attention with a haiku not-so subtly directed at her. Recruited to the cause along with her sister, Umi naturally devises a highly practical approach to the problem, which Shun quickly sees the wisdom in. So now it's a race (some actual racing about does take place in the final act) to save the clubhouse and their relationship. But even then, nobody wigs out. Everybody's got his head screwed on right. Thankfully, even the grown-ups are grown up. This backwards glance at the Japan of a half-century ago is certainly steeped in nostalgia. Though thinking about the Japan I experienced fifteen years later, the cluttered, warmly-lit nooks and crannies of Tokyo and Yokohama at times looked awfully familiar to my eyes too. I've bought croquette and tonkatsu at shops just like that. 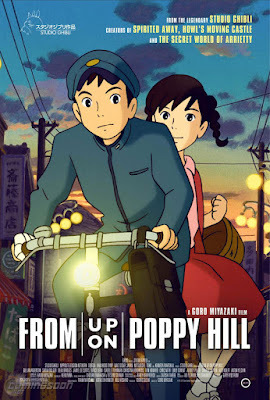 From up on Poppy Hill is a gentle melodrama about good, decent, hardworking people. There's no reason for that to ever grow old. Anton Yelchin (Chekov in Star Trek) in the leads, and featuring the voices of Chris Noth, Gillian Anderson, Jamie Lee Curtis, Beau Bridges, Bruce Dern, and a few lines from Ron Howard. A note about the names: Umi (海) means "sea." Sora (空) means "sky." Riku (陸) means "land." Shun (俊) means "sagacious."